From the jungles of the Amazon to the tar sands of Alberta, indigenous people of the Americas are standing up to the fossil fuel empire in defense of Mother Earth. In many languages they are saying, “Respect your Mother. Protect your children.” These are the common sense principles for the survival of our species. Yet the majority of our industrialized society fails to live by them. Colonizers started a pattern of disrespect and exploitation on Turtle Island, the native name for North America, which disrupted thousands of years of devoted stewardship by native people. Today, as we experience catastrophic climate change, there are signs of hope that some communities are awakening to a new relationship with Earth, and with indigenous people. At the Standing Rock encampment in North Dakota, I was among thousands of non-native allies who joined Native American water protectors fighting an advancing oil pipeline in the fall of 2016. Throughout the encampment, banners and t-shirts worn by native teenagers exclaimed, “Defend the Sacred.” I went in service to express my commitment to indigenous rights and gratitude for the Lakota’s brave defense of our common Mother. For many months, multicultural, intergenerational groups of supporters traveled to Standing Rock, where they experienced native values of respect, reciprocity and reverence for the Earth. Though the pipeline in North Dakota prevailed, the spirit of Standing Rock lives on, calling us to continue the struggle, to act with courage to protect our places throughout the continent for generations to come. When I discovered Lancaster Against Pipelines (LAP) on a spring day in 2017, I cried for joy to find the same values I had experienced at Standing Rock: sharing, cooperation, and love-based, non-violent action to protect the water, land and communities of Lancaster County, Pennsylvania. My daughter and I attended a gathering at The Stand, a structure built in the path of a 42inch fracked gas pipeline that LAP opposes – one that would tear through woodlands, rich farmland, and creeks, while perpetuating reliance on climate-destroying fossil fuels. At the Stand, I joined the struggle to “Defend the Sacred” in my home state and beyond. During the summer I made several trips to The Stand, sometimes bringing friends from Philadelphia, to learn about the struggle to stop the Atlantic Sunrise Pipeline. Williams Partners, the pipeline company, based in Oklahoma, is benefiting from an abuse of eminent domain in which private land in the path of their pipeline is being condemned, not to benefit the public as eminent domain was intended, but rather to increase corporate profits, while bringing desecration and risk to the community. After civil disobedience training by Greenpeace, in which I participated, LAP organized five actions to block the progression of the pipeline, including on October 9th, when the group formed a 16-vehicle blockade to prevent workers from accessing the drill site. A week later, members gathered around an excavator on property owned by the Adorers of the Blood of Christ, an order of Catholic nuns that built a chapel in the path of the pipeline on property which Williams obtained by eminent domain. That day at the construction site, 23 people were arrested and charged with defiant trespassing, in the name of protecting their land. 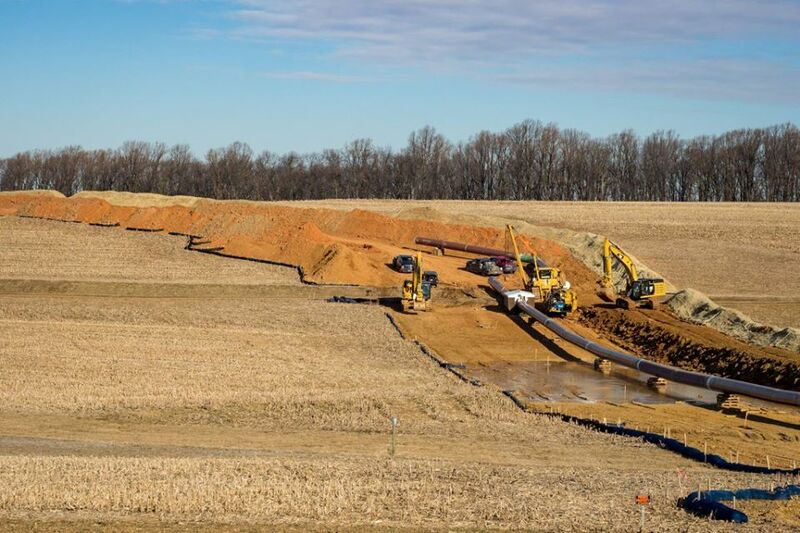 In total, 45 people have been arrested since pipeline construction began. For some of the defenders, this is the land their families have loved and have cared for since they arrived as settlers in the 18th century. For others, it is the land they have chosen as their home and have taken responsibility to protect. It’s also the land that produces much of the fresh food for the farmstands and markets in Philadelphia. As stewards of our homeland, it’s our responsibility to fight, too. Like Standing Rock, there is little chance of stopping a pipeline backed by powerful corporations and politicians, when all legal means have been exhausted. Nevertheless, it’s imperative that we resist. Our voice and action are needed to demand justice from eminent domain, bring a transition to renewable energy, and force political change in Harrisburg and Washington, so that we can at last take responsibility for the land that gives us life. This family-friendly event begins at 9:30 on Saturday, March 10, at Trinity Reformed UCC, 450 W. Main Street, Mountville, PA, where there will be a brief rally with coffee and donuts. Bring a bag lunch. Participants will leave cars and board a bus to the action site, and from there to the chapel for the closing celebration. Transportation back to the cars will be provided. If you are interested in coming, please email me at info@judywicks.com, for further details and for carpooling options. If you cannot come on March 10, please consider donating or volunteering at www.wearelancastercounty.org. and  ensure the health and safety of our residents. For four years, we’ve opposed Williams’s plans to run a dangerous, fracked gas, export pipeline through the heart of our communities, using every legal means available to us. Yet our system of government, at all levels, has failed to protect us.